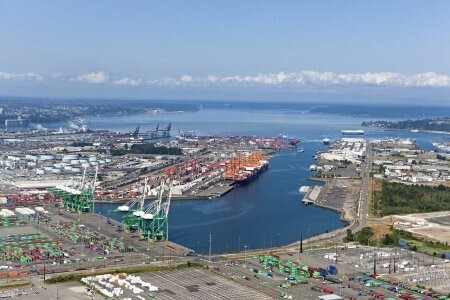 As a major West coast shipping terminal, the Port of Tacoma (Port) is a gateway for a variety of imports and exports from international and domestic markets, such as Asia, Australia, and Alaska. More than just ships, the Port also manages rail infrastructure and other shipping-related industries surrounding its four waterways. In such a complex and dynamic setting, effective decision-making requires quick access to timely, accurate information. The Port guides these decisions through an internal geographic information system (GIS) database to manage just about everything: real estate infrastructure and property maintenance, utilities, and environmental protection areas, just to name a few. Aspect provides Enterprise Geodatabase and GIS data management support to the Port, organizing and updating spatial datasets—and the underlying functionality of the enterprise database—that keeps their business processes running efficiently. Our work on this enterprise geodatabase was and is supportive of a variety of business and operational functions, including an internal webmap application, connections to external databases, and mobile field data collection workflows through ArcGIS Collector. Our development and refinement of geodatabase functionality (such as topologies, flow-enabled geometric networks for stormwater utilities, and python-based data migration/ETL scripting) enhanced data performance, fidelity, and analysis capabilities. Through this effective and reliable geodatabase, the Port can efficiently manage its assets and operations across its properties and tenants—and keep business thriving.